I'm just days away from teaching my very first cookery course! Whilst I've been getting everything ready for next Saturday, I've been looking back to where my love of cooking started and remembering the day I gave up eating dairy for ever! When I was 20 and in my third year at college in Leeds, I decided that, instead of sharing digs with friends, I would rent my own bed-sit. It was just one room on the top floor of a large house, very small and compact but well designed and wonderfully light. It was great having my own space at last and what I loved most was having my own kitchen! It may have been tiny but it was here in this neat little kitchenette that my love for cooking was born. Every Friday I'd go to Leeds market and come home on the bus laden with bags of fresh produce ready to try out a new recipe. My boyfriend Eric worked in Manchester and came over most weekends. He remembers arriving on a Friday evening, climbing the stairs and being met by delicious aromas permeating from the top floor! Yoga had already become part of my life at college and for two years I was secretary of the yoga club. Our wonderful teacher Doreen Musgrove inspired us all with her healthy approach to life and her love of eating natural foods. When I moved back to the South East close to London in 1978, it wasn't long before I was eating regularly at vegetarian cafes and restaurants and going to Health Shows like the Festival for Mind and Body which were just beginning at Olympia then. Cutting out meat seemed an easy choice to make when the alternatives tasted that good and certainly, being an animal lover, I felt more at peace with myself not eating it. I remember the decision to stop eating meat was made one evening, after a particularly good meal at my local vegetarian restaurant in Wimbledon Village! Unlike many vegetarians, who substitute cheese and eggs in place of meat, Eric and I were both naturally drawn to a more plant based diet and also still chose to eat fish. Nearby, Kingston upon Thames held a thriving daily market and it's superb fish and fruit and vegetable stalls supplied most of our requirements! Eric shared my interest and together we came across many new pioneering books on health. One in particular described a new way of eating that made complete sense - a totally animal-free diet, cutting out all meat, eggs and dairy produce. Reading how a group of people in Wales had overcome illnesses such as cancer and arthritis by not eating anything from an animal made a huge impression on us both. Even though such a diet was pretty radical back in 1980, I immediately cleared out my fridge and cupboards of all animal products! This proved to be a defining moment and one that would herald the way for a complete change in lifestyle for us both from then on. Making the decision to change your diet or lifestyle is a very personal one. Firstly, it needs to be combined with a healthy approach to all aspects of your life to create balance and lasting well-being. Secondly, it's important to make the decision based on your own thoughts and feelings. When you do that, the decision is easy because you are simply expressing yourself and your individuality. 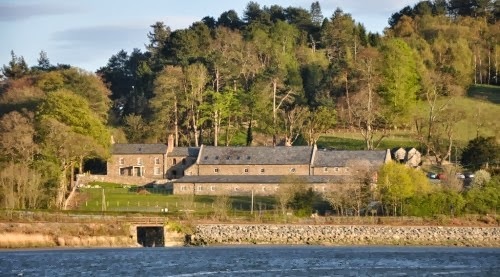 Next Saturday, 19 October 2013, I'm thrilled to be teaching a dairy-free baking course at the Bodnant Cookery School in the Conwy Valley, North Wales. Click here for all the details and watch out for new courses in 2014!